A 3D platformer with varied gameplay and a lot of collecting. The structure is roughly hub-and-spokes with a handful of areas each containing several levels. The main collectible (“time pieces”) unlocks new areas at a brisk pace (the final boss is unlocked at 25 out of 40 time pieces). Side collectibles include yarn (which allows for the creation of new hats with new abilities), a currency called “pons” (which can be spent on badges that enhance or modify your abilities in various ways), and new skins and color schemes for the hats and the player character. Gameplay varies in sudden and surprising ways. The first area is a wide-open island that begs to be explored, but the second is split into a series of levels - several of which are linear and feature frustratingly half-baked stealth gameplay. The third area is a dark forest that you can explore and opens up further as you find and solve hidden platforming challenges, but lacks good reference points for finding your way around and includes a level that removes most of your abilities and plays as tedious survival horror. The fourth area is finally back to pure platforming and I get the sense it’s intended to feel like an epic culmination of the game - but it doesn’t, because the previous content is so disconnected that it doesn’t really lead up to anything. There isn’t even a good narrative throughline - the first area effectively sets up an interesting antagonist who prompty disappears and isn’t mentioned again until the endgame. The game’s biggest problem, though, is that it is an exploration-heavy platformer that punishes exploration. One way is through enforced backtracking - for example, the first area has collectibles that you can only get after gaining abilities from the second and third areas, so exploring it thoroughly in the beginning is a waste of time. Another is that death tends to reset your mission-specific progress. Having to redo a failed platforming challenge makes sense as punishment; having to redo a bunch of exploration and collection because you failed an unrelated platforming challenge does not. As a result, the “time rift” mini-levels with pure platforming challenges were my favorite part of the game, as they were the only part that reliably had coherent design. The game oozes personality and the surface level has been polished to a shine. But charm only works as long as the game’s core is strong enough to back it up. The first area was a joy to explore and had me falling in love with the game. But after that the cracks started to show. The low point was the aforementioned survival horror level in the third area, in which you have to avoid a malevolent spirit as you make your way up to the attic of a haunted manor. The ghost is impressive and unsettling - you can never quite focus on it and as it comes near the music gets much more tense and the visuals distort in satisfying ways. But underneath that is unsatisfying gameplay - all you do when the ghost approaches is hide under some furniture and wait it out. The ghost can’t see you when you’re hiding, and there’s nothing you can do to make it go any faster. There’s no tension or challenge - the ghost approaching just means you have to find the nearest hiding spot and stop playing until the coast is clear. This is not the game I signed up for. 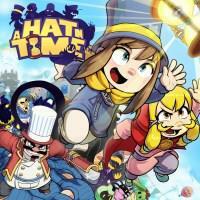 While there is plenty to love in A Hat in Time , the game doesn’t seem to understand what makes it good, and it serves up a disjoint mishmosh of experiences of varying quality with equal enthusiasm. The first hour or so is great, but it’s not representative - I wish they’d continued making that game instead. I Stopped Playing When: I sampled every area and found I really only enjoyed the first.